La utilización adecuada de las redes sociales es fundamental para el que realiza el trabajo periodístico. Por ello, Twitter ofrece tips que pueden ayudar a los periodistas para darle mayor difusión a su trabajo. Journalists and news publishers have long sought the best ways to create engagement on Twitter and make the most of every Tweet – and we want to help. We’ve created a set of best practices for journalists and newsrooms that can help you increase follower growth and engagement on Twitter, based on extensive research by our Platform and Analytics teams. The team analyzed thousands of Tweets from more than 150 news brands and individual reporters around the world, determining four specific areas of focus: tweet your beat, use hashtags for context, @ cite your sources, and share what you’re reading. One of the best ways to increase Twitter engagement is to Tweet regularly about the subjects you cover. Our research shows that for people who post a concentrated number of Tweets in a short time span, follower growth is 50% more than average (1.5x). Live-tweeting or posting updates about a news event related to your beat is one way to grow followers and increase interaction. During a tornado last year, @TuscaloosaNews tweeted minute-by-minute updates, including pointers to emergency resources. For this effort, the newsroom was awarded the Pulitzer Prize for Breaking News. Per @tuscaloosacity, Mayor Walt Maddox has received confirmation of 32 deaths and 400 injuries in the wake of yesterday’s tornado. When crime reporter Sara Ganim (@SGanim) from the central Pennsylvania Patriot-News tweeted the Jerry Sandusky trial, she saw a 2,000 follower spike. Twitter users who continue to live-tweet news relevant to their beat often see a steady stream of new followers. Tweets with hashtags (the # symbol, immediately followed by the subject or keyword related to the Tweet) can increase engagement almost 100% (2x) for individuals and 50% (1.5x) for brands. Journalists and news publishers use hashtags to organize conversations, gather feedback, and to identify and engage with Twitter users discussing a particular topic. Fox News (@FoxNews) uses hashtags to identify the subject of its Tweets and to participate in the Twitter conversation about that person, place, thing or event. @CBSChicago uses hashtags to group Tweets into a conversation that makes it easy to follow or engage with. For example, the #DrewPeterson hashtag was included in the Tweet below to identify news related to the local trial. When you include hashtags in your Tweets, your Tweets become more visible, and over time you gather more Twitter followers. When tweeting about or to a Twitter user (individual or brand), include their Twitter handle (the @ sign, followed by the username). Brands that tweet 20% fewer URLs and 100% more @mentions grow followers 17% more than average. What that tells us is to mix up your Tweets so your feed isn’t just links to your stories. Post tweets that include URLs, but also tweets with @mentions, and tweets with no links at all. Inside Breaking News (@breaking) frequently includes the Twitter handle of the source of the links, photos or videos in its Tweets. Including the Twitter handle of your sources can increase follower growth and engagement. News accounts receive 100% more (2x) active engagement on a high-performing Tweet when a URL is included. To increase the engagement on your account and Tweets, mix it up a bit: when individuals share URLs to non-company sources, they experience a bump in follows. Among those who share links to content not generated in their newsrooms are The New York Times’ Brian Stelter (@brianstelter), MSNBC’s Rachel Maddow (@maddow), and The Atlantic’s Alexis Madrigal (@alexismadrigal). Use the Retweet button as a tool to curate content for your followers. Individuals with above expected follower growth send 200% more retweets (3X) compared to individuals with below expected follower growth. 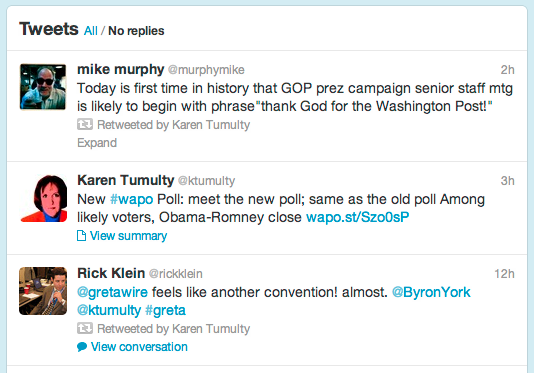 For example, The Washington Post’s Karen Tumulty (@ktumulty) has a high rate of Twitter engagement because she shares interesting content she has come across. You’ll find additional resources at bit.ly/TwitterForNews and by following@TwitterForNews. If you’re in town for the ONA conference, we hope to get a chance to meet! CUADERNOS DE COMUNICACIÓN EVOCA. 7. EL FUTURO DEL PERIODISMO. It’s amazing to pay a visit this web page and reading the views of all friends concerning this piece of writing, while I am also eager of getting knowledge. a post on a site or I have something to add to the discussion. if you don’t mind. Is it only me or do a few of these comments look like left by brain dead individuals? 😛 And, if you are posting on additional online sites, I would like to keep up with you. Could you make a list all of all your social pages like your twitter feed, Facebook page or linkedin profile?